Look at this wonderful shoe rack. Now I know where my shoes are. It’s much better than my old shoe box that I had to dig through to find the particular pair of shoes I wanted. I want to share the joy so – here is my tutorial on how to make one. First, trash pick a wooden bookshelf. It should be real wood, but somewhat warped. Sure, you could buy wood, but that would take all the challenge out of the project. Fourth, notice the wood and think, wow, I need a shoe rack. Now that it is just wood, I could put it together better. Cut the too long sides into the same size at the shelves so you have as many boards as possible to put together. If you want to hurry up the process go to your hardware store. They will cut boards for a dollar per each cut. They will do it cheerfully without arguing that your idea will never work. In fact, they will do it without even knowing why you want boards cut. Five, ask your husband to make you a shoe rack. Have the first argument about how it will never work, how the space you want to put it in is too small. Demonstrate how it will fit with your newly cut boards. (This is why the crucial taking it to the hardware store step is so important and time-saving.) Threaten to just drive to Ikea and get the same thing for 50 bucks- but still needing to be assembled. Six, if you are lucky enough to have been married 20 years, go to work. Come home completely surprised when you have new shoe rack. This is the tricky part, if you have only been married 19 years you will have to watch the whole putting-together-part. That is why it is best to be married 20 years. I just discovered that when you put in the full 20 years of watching, you have paid your dues and you don’t have to watch any more. Just come home from work and Ta-Da! 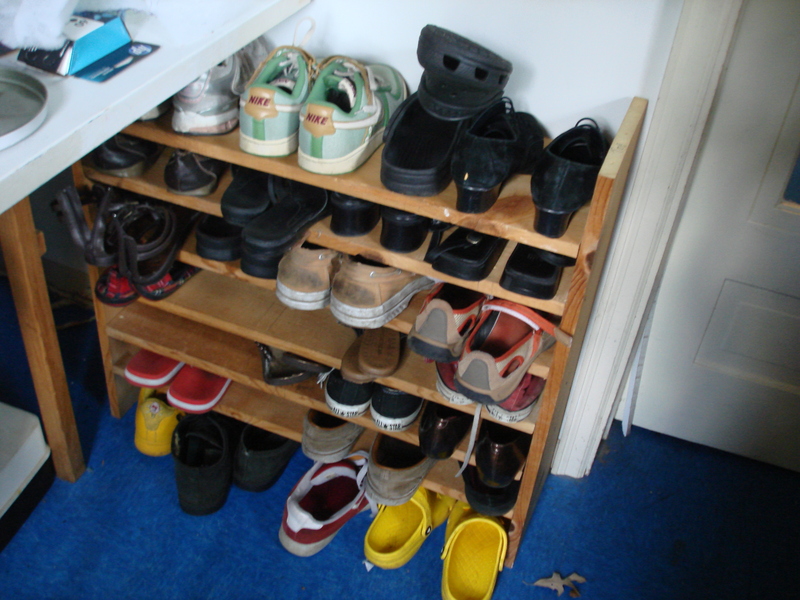 shoe rack! Like shoe rack elves or fairies came to your house, except even better it is your awesome husband. Thank you, thank you, sweet husband for my awesome shoe rack!